Born in 1959, lives and works in Gothenburg. Joakim Stampe is today one of the leading performance artists in Sweden. Since 2006 he has created more than 100 performance art works and is frequently invited to festivals and events all over the world. He has showcased his work in more than fifteen countries in Asia, Europe, as well as in North and South America. Born into a creative environment, his parents were both renowned and socially engaged artists, Joakim Stampe started out to draw and paint in his early childhood. Going from easel painting to object painting, he became in the early 1990’s more and more involved in ephemeral street art. 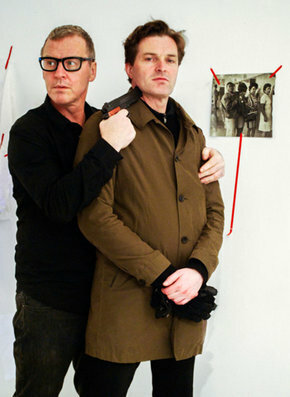 From 2006 and the start of Live Action, which he co-founded, Joakim Stampe subsequently started to focus on performance art. However, without leaving his work with public street art behind which he today has developed into the ephemeral world of water painting. Highly imaginative, Joakim Stampe’s performance work can not be categorized to a certain style. In his work he has a predilection to find and use new and unexplored materials. Having understood the inherent qualities of performance art, i.e. time, body and mind, human scale, and the role played by imagination and immediate intuition, he usually refuse to repeat or reproduce earlier works. He is also known to consciously expand the palette of materials used in his performances. Going beyond the traditional and more and more banalized materials in performance art, Stampe tries to invent and renew his own immediate world of materials, objects, and how to work with them. As such his work is very much intuitive and imaginative, although he usually have a story to tell. Whether it is about his own personal background, contemporary politics or both, he creates images of poetry, conceptual but always with an emotional mind. Joakim Stampe. Project 16 – Hostage. Rostrum Gallery. Malmö, Sweden 2012. Photo : Chuyia Chia.